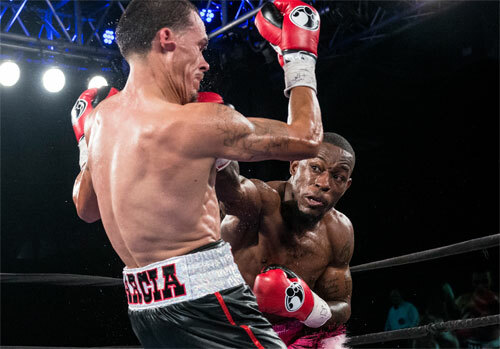 In the main event at the 2300 Arena Friday night, North Philly’s Tyrone Brunson, 23-6-2, 22 KOs, and Vineland’s Ismael Garcia, 10-0-2, 4 KOs, engaged in a disappointing draw over eight rounds. The fight, expected to be a dramatic crossroads clash between two fighters in need of a win, turned out not to be so. 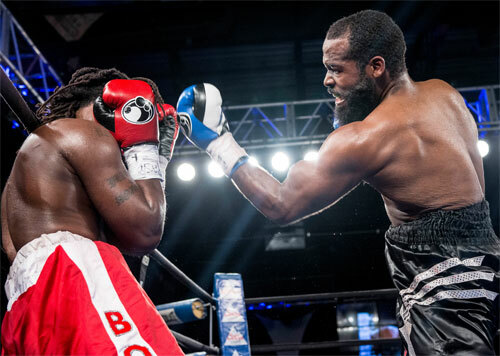 Throughout most of the fight, Garcia boxed cautiously, while Brunson passively followed him around the ring and put off his heavy-fisted attack. The result was a dissatisfying snoozer with little action. Garcia, long and lanky, couldn’t help but use his jab and boxing skills to set the careful pace. However, he never stepped up the action when Brunson showed his distaste for battle on this night. Tyrone’s disconnection was a gift to Garcia, but he failed to accept the gimmie. Brunson appeared to be in a similar mood as Garcia. Usually a life or death brawler, Brunson brought none of his usual fire. He landed solo rights in round three and five, but they failed to put Garcia in danger. As the rounds slipped by, the reality set in that this fight, thought to be a possible Fight of the Year candidate going in, was instead going in the direction of being utterly forgettable. 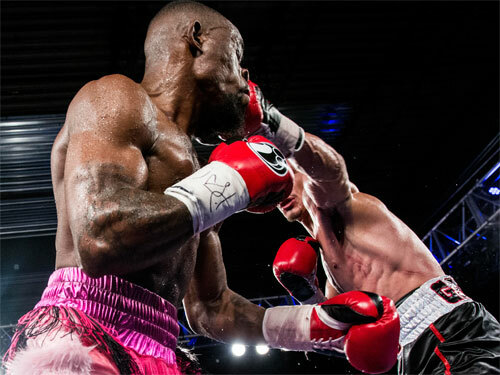 Finally in the eighth and final round, Brunson began pressing the action. Normally his onslaughts come early in a fight and fade as time ticks by. Perhaps he saved his gas until he could see the finish line, but the sudden rise of activity only brought thoughts of what this fight could have been. 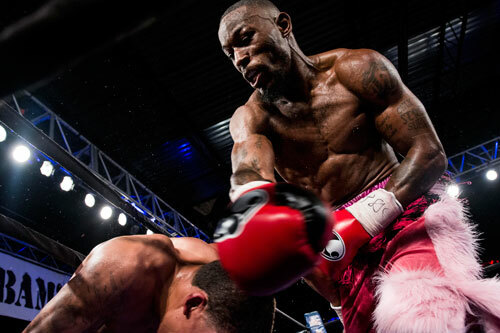 Brunson fired his right in the last round, and it hit the mark a few times. Garcia’s left eye began to spit blood and suddenly we had a fight. Both boxers fought with urgency for most of the final three minutes. However, the bell ended matters just when things were getting good. The scores were all over the place. 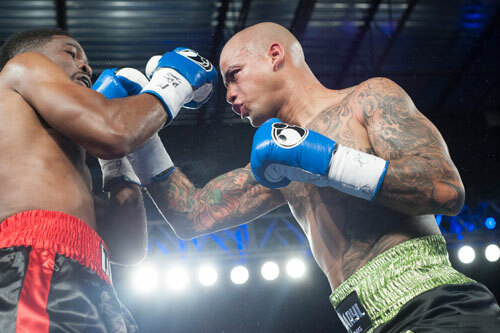 Two of the official judges scored the bout 78-74, one for Garcia and the other for Brunson. The final judge, John Poturaj saw the fight a 76-76 deadlock. On press row, the scores varied just as much. Some favored Brunson while others had it for Garcia. My card favored Garcia five rounds to three, but to be fair there were many close rounds. So, perhaps the draw was most fitting. Given the effort and chemistry between the two fighters, a rematch is probably not in order. 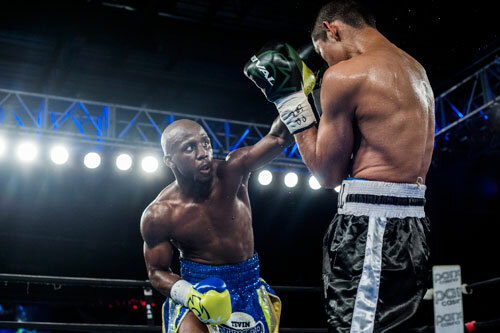 Junior lightweight Tevin Farmer, 23-4-1, 5 KOs, promised to light up the undercard with his co-feature spot on the show. However, his performance, although dominant, was not the usual thrill ride of flash and skill he usually provides. Farmer banked round after round against his tough opponent, Orlando Rizo, 19-8, 11 KOs, but he looked bored and unmotivated by the task. As Farmer swept the rounds, one minor drama developed. 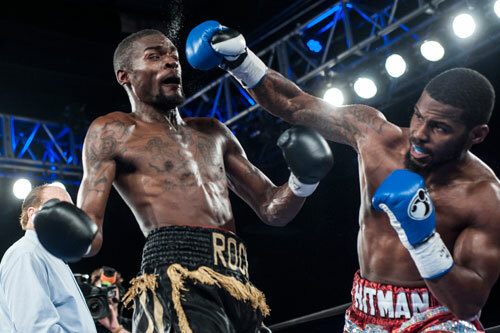 Tevin worked Rizo’s body throughout the fight and several times his punches strayed below the belt. On his third warning, referee Hurley McCall subtracted one point from Farmer in round four. Farmer kept punching and did not ignore Rizo’s body. 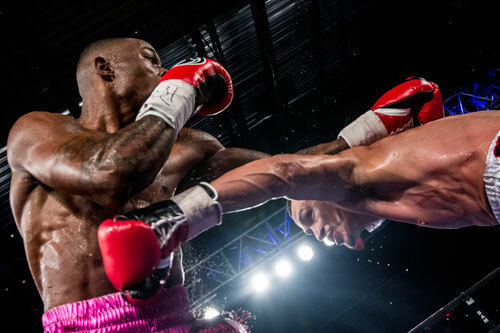 He continued to fire low blows, and lost another point in round eight. In round five, Rizo plastered Farmer with a right along the ropes that appeared to stun Tevin. The Philadelphian kept moving and appeared okay before the bell ended the round a second or two later. By the end of the fight there was no question about the decision. Farmer won every round on my card, but the two penalty points made two of the rounds even. My score was 78-72. Two of the three official judges agreed and turned in 78-72 scores. Dewey LaRosa gave one round to Rizo and had the fight a point closer, 77-73. Farmer is scheduled to return to the 2300 Arena in December. 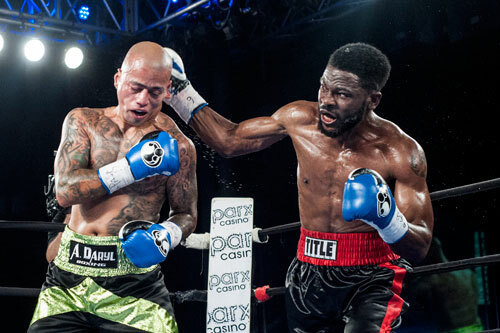 In a battle of two odometer-busters, lightweight Victor Vasquez, North Philly, and Osnel Charles, Atlantic City, faced each other for the fourth time. 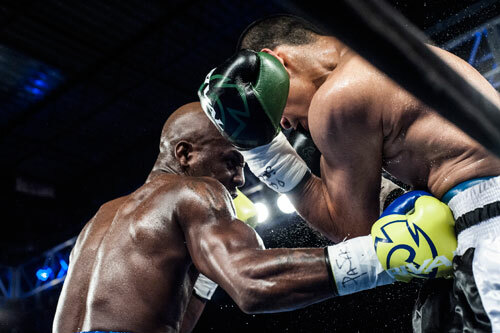 Vasquez, one of the most popular local fighters in recent years, evened the score of this rivalry with a close unanimous decision over six rounds. Vasquez, 20-11-1, 9 KOs, started the fight well, taking the early rounds. Charles, 10-16-1, 1 KO, did better later in the fight. There was a good two-way exchange near the end of the second, but in this fight, the many miles, measured three minutes at a time, really showed on both boxers. 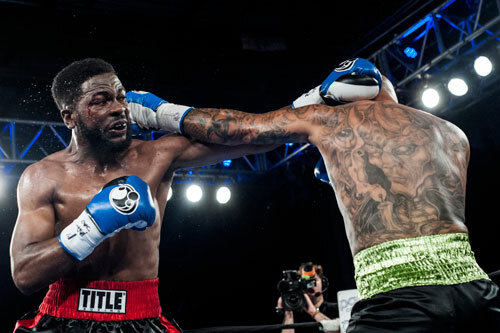 Charles punctured Victor’s left cheek in round four and it produced the familiar sight of Vasquez’ blood. Victor has fought through bloody eyes throughout his career, and it didn’t stop him on this night either. By the next round, a mouse began to rise under the same eye. It was in this fifth round, that a glimpse of the old Victor Vasquez flickered in the 2300 ring. Charles was having a good round, punching away and puffing Victor’s eyes. Vasquez looked tired. Then suddenly, he began fighting back hard. The surge brought back many, many great memories of Victor’s old fight reel. Time after time in the past, Vasquez fought through bloody eyes and incoming punches. There was never a Philly fighter tougher than Vasquez and the fans loved him for it. His fights were always must-see wars. He battled back well against Charles in round five, but this was not the same fighter. Even his 135-pound body, a head-to-toe billboard of tattoos for as long as I can remember, wasn’t the same. Vasquez is still a lightweight, and at 33 competes in the same weight class he always has. But tonight, his tattoos were folding slightly around the middle. It was age and the gentle softening of time. Vasquez has been at this for too long and his days in the ring are numbered. Despite the slide, Victor took the official decision by scores of 59-55 and 58-56 twice. On my card, he edged Charles in the final round to squeak out the win and even their series at two fights apiece. A fifth and deciding bout could happen between the two, but there is no need for Vasquez (or Charles for that matter) to give any more blood in the ring. However, if Vasquez does continue to fight on, I will be there until the bitter end. 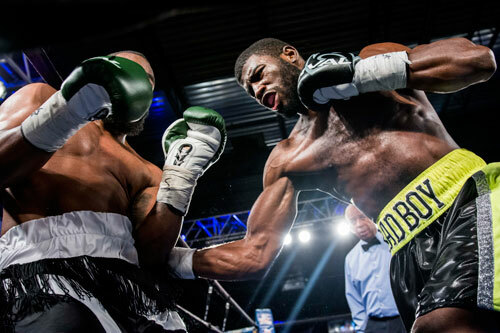 North Philly’s Anthony Burgin, 10-2, 2 KOs, bounced back from a controversial loss in July to take a 6-round unanimous decision over Fellow North Philadelphian Gerald Smith, 3-3. Burgin won every round on my card and cut Smith in round two. Two of the judges also scored the fight a shutout, while the third saw it closer, 58-56. 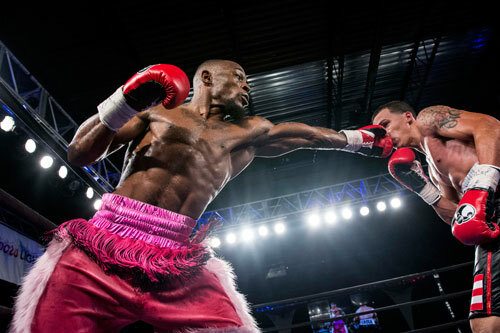 Welterweight Hasan Young, 6-1-1, 2 KOs, returned after nearly three years away from the sport to post a clear-cut points victory over Baltimore’s Kevin Womack, 7-13-3, 5 KOs, in his comeback fight. Young looked strong, firing dangerous right hands from every angle. Finally a left hook in the fourth and final round almost dropped Womack. A big right just before the bell punctuated the attack, but Young had to settle for a one-sided decision. The scores were 40-36, 40-36 and 39-37. I scored the bout 40-36. North Philly’s Steven Ortiz, 5-0, 1 KO, remained undefeated against Daniel Tran of Oklahoma City, 4-6-1, 1 KO. Ortiz took the opening round and then hurt Tran badly in the second. Tran remained on his feet, but a final left hook and right hand convinced referee Hurley McCall to stop the lightweight fight. The time was 2:20. 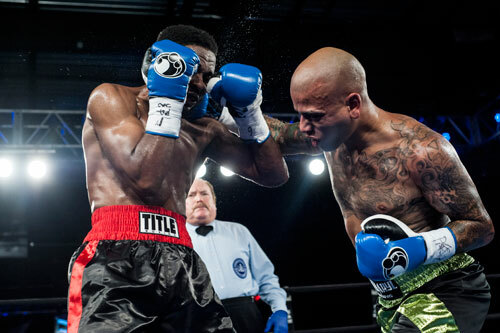 Ortiz, Tevin Farmer and Anthony Burgin all fight out of Cherry Hill’s Victory Boxing and Fitness under Chino Rivas. 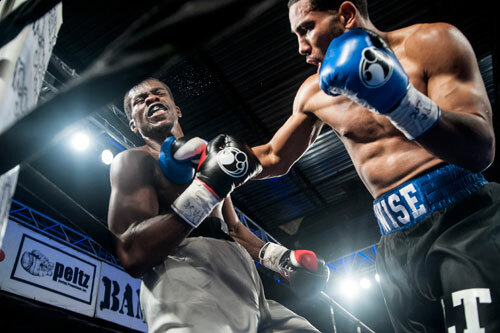 Philly’s Isaiah Wise won his third straight bout, 3-0, 2 KOs, but was extended to the distance for the first time by James Robinson, 4-5-4, 1 KO, of York, PA. Wise closed the show with a knockdown in the fourth and final round, but ran out of time to finish his foe. He won by official scores of 40-35, 39-36 and 38-37. My score was 39-36. 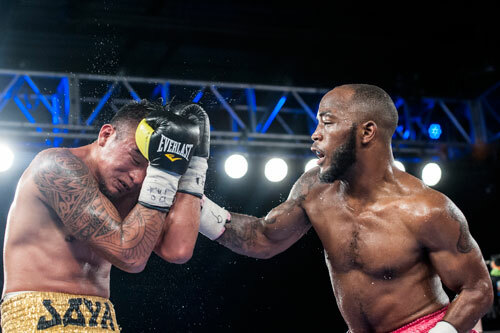 In the show opener, Fred Jenkins Jr., 10-3, 3 KOs, looked strong winning a 4-round unanimous decision over Ibrihim Shabazz, 2-4-1, in a middleweight bout. Jenkins swept every round on my card and won officially by scores of 40-36 and 39-37 twice. In the walkout bout after the main event, Baltimore’s Mike Reed won fight number twenty, 20-0, 12 KOs, with a 6th round TKO of Jose Aaron Herrera, 21-6-1, 12 KOs. The southpaw dominated every round before dropping Herrera with a body shot in the sixth. Herrera crumbled to his knees and his corner stepped up and indicated they wanted the fight stopped. Referee Hurley McCall complied and called the scheduled 8-rounder over at 3:00 of round six. Despite indications of soft pre-event ticket sales, the 2300 Arena was practically filled. 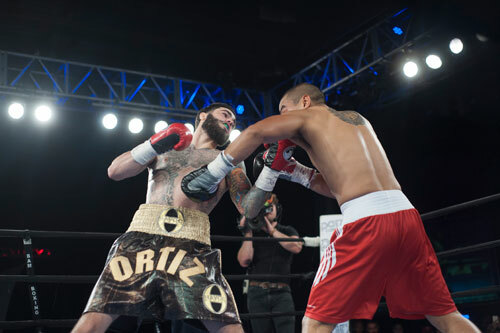 The show was promoted by Peltz Boxing, BAM Boxing and Joe Hand Promotions. They return to the same venue on December 2nd with a card featuring Tevin Farmer.